Two of the most foodie-prized mushrooms in the world, picked wild at their flavor and aroma peaks. 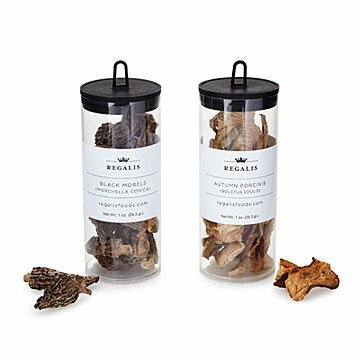 These morels are wild-harvested (it’s a hard-to-find mushroom that can't be cultivated) in Montana forests during their brief summer season. Porcini are best foraged wild like these, gathered in Oregon in autumn. Both types are hand-selected at their flavor and aroma peaks, then preserved by drying. Renowned mushroom expert Ian Purkayastha, who began foraging delicious fungi in his small Arkansas hometown at age 15, directs their harvest and handling. Hand-foraged in Montana and Oregon. Packaged in New York. It all started on vacation with a plate of truffled ravioli. Ian Purkayastha returned home to his small Arkansas hometown and immediately began foraging mushrooms. He was 15. Between high school classes, Ian started selling truffles to local restaurants, and put college on hold to grow his business. Since then, his passion has taken him to the forests of Hungary, the Himalayan foothills, and the concrete jungle of Manhattan, where his bounty can be found on the menus of Michelin-starred restaurants. "My dad had moved to America from India and become an entrepreneur… and mom is Texas tough," he wrote in his memoir, Truffle Boy. "They agreed to my plan, which most parents would have shut down as a pipe dream." Store in a cool, dry environment. Soak in water in order to re-hydrate mushrooms. There are great for fried mushrooms. I don't soak them for as long or in as much water. You want as little of the juice departing as possible.